Four Months ago about this time I was thinking you would almost be here. Four months ago I would have been wrong. The labor in hindsight was pretty fast, but at the time it seemed to last so long. Four months ago I was wishing that I had better insurance so that I could bring on the drugs already. Four months ago I she-womaned it up and popped you out all-natural. Four months ago I thanked you for coming out so quickly. Four months ago I met and fell in love with you. Four months ago you came into our family. Four months has come and gone so quickly, and so quickly you have gotten big. So quickly you started giggling. So quickly you fell in love with your brothers. So quickly they fell in love with you. So quickly you are getting more aware of the world around you. So quickly you are stronger. So quickly you are no longer a newborn. So quickly four months goes by. We would like to announce the advancement of one Larissa Zitzman to the rank of official soccer mom. Her move up the ladder of motherhood was assisted by the purchase of a shiny new minivan...and nothing to do with the playing of said sport soccer by one or more child (which apparently does not automatically advance your rank). When asked about her feelings she could be found to say, "I once swore I would never own a mini van and a friend told me I would someday change my mind and on the day I got one it would be the happiest day of my life...I have changed my mind...and it truly was the happiest day of my life!" ...and list could go on for several posts. BUT no I can't do most of those things right now, and that is just dandy with me. I have three of the most precious little monsters ever. I love that I can be brought to joyous tears just looking at their cute faces as I realize they are mine and are part of me. A picture is worth a thousand words...so here are 3,000 words...okay 3 pictures documenting what Jack loves about summer. I don't normally participate in giveaways...because well I am a pessimist and figure why try. I know how bah-humbug...I told Spencer it is kind of like waiting in line at a buffet except after all the cattle like waiting you don't get the food. So yeah, I normally don't do it. 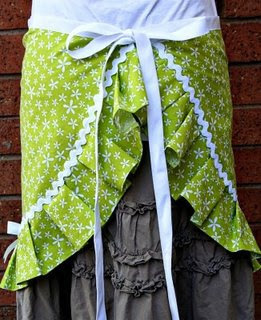 BUT I stumbled across this giveaway and I LOVED this lime apron. 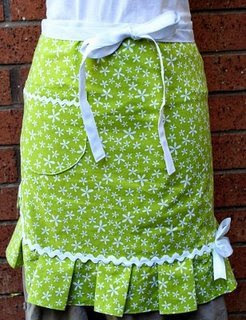 SO here the glass-is-half-empty-gal is overcoming the negative attitude, sharing the love of this apron, and taking a stab at winning this adorable apron. I mean really, how cute would I be cooking up a storm in this thing. PS if I don't win this thing I might just try to imitate the thing...imitation is the sincerest form of flattery, right?